I lost my dad on Friday. Nearly all the things that can happen to someone fighting Type II Diabetes had been put upon his plate. “Respiratory Failure” I suspect will be the official cause of death. The moment I lost him, that moment stole my breath away. Paul and I went to see him just a few weeks ago. We had a late flight, and found a hotel near the airport. We left for the three-hour drive through rural East Texas the following morning, pointing out the insanely large trucks and SUV’s along the way. It’s all bigger in Texas. Thankfully, a mixup at the car rental lot left us in an SUV of our own-albeit not the size of most. My stepmom called with news that my dad was taken by ambulance that morning from their small-town hospital to a larger facility. They were on their way to dialysis, when he started having trouble breathing. We arrived at the hospital in Tyler just as my dad was being admitted into intensive care. That’s where I had my last visit with him, deep inside the hospital, beyond heavy mechanical doors. My parents divorced when I was five, and there had almost always been miles between us. Miles, but never distance. He was easy. He was easy to please, easy to love, and the only thing he ever wanted for me was happiness. He played the accordion as a boy. 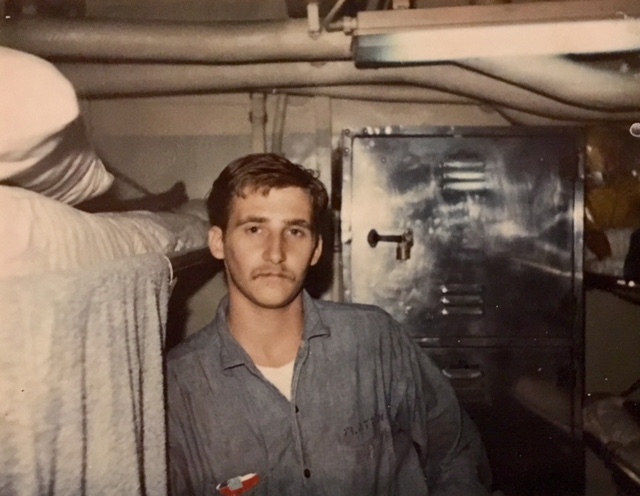 He joined the Navy during the Vietnam War-perhaps contributing to his later lung damage. He was a Mama’s boy. He loved motorcycles and Mustangs. He could play the guitar by ear. He loved blue grass music. He’d been known to have a pretty epic handle-bar mustache from time to time. He loved nice jewelry and had a ring for every finger. He worked hard but always worked to live, he never lived to work. He once told Paul that if he wanted something than he should find a way to go out and get it, because you only live once. I spent summers with him in Texas, until I became a teenager and decided that I couldn’t possibly leave my friends. When I got my driver’s license he bought me a Chrysler Laser and drove it from Texas to Minnesota for me. The hood had sun damage from the hot Texas Sun, I kept the Texas plates as long as I could-it was the coolest used car on the planet. During our Groom’s dinner, the night before my wedding, he pulled me aside quietly to give me a gift. It was a ring he had designed using stones from a ring my Grandmother had. I walked into his hospital room relieved, as a part of me had worried that we might not make it in time. He had lost more than 100 pounds, and he had somehow aged decades over the course of two years. It took me a moment to find him, to see him in this frail man. Thankfully, his eyes had remained unchanged, expressive and tender as ever. I spent time holding his hand, telling him about his grandkids and making sure he knew how much I loved him. 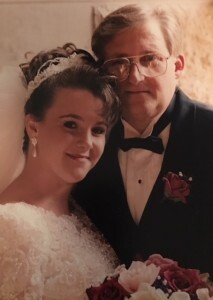 I recognized how devoted my stepmom had been to him, and how much he needed her. I watched my oldest brother lean into him and apologize for words they had shared months ago. The ventilator took his ability to speak, and so my father reached out to him and instead held his face in the palm of his hand. I watched my uncle work to catch his own breath after seeing his brother. He endearingly called him “big brother”, and told him he loved him. I watched my uncle and brother tenderly shave his face, they worked carefully around the ventilator’s tubing and the straps on the side of his face. We had to leave the room for hours at a time, as kidney dialysis nurses pushed in their equipment to filter the toxins from his blood. I spent time lying across a bench under a grand southern magnolia tree in he hospital courtyard. I closed my eyes and let the sun warm my face while I talked to God.My last evening with him we stayed as long as we could. He had been heavily sedated and still I left the old western he had been watching on for him. Just Paul and I sat with him, Paul allowing space, while I sat at his side. I tried my best to etch his image into my memory, while time in the room slipped away. I reached down to kiss him-my heart tangled in grief. With all that I had, knowing it would be my last moment with him, I walked away. Paul held my hand and walked beside me. He pushed the button for the heavy mechanical doors to open and then close behind us. I set my phone down on my kitchen counter, and I turned and searched for a chair in the front room of my home. Full sunlight poured in through the picture windows. I pressed the palm of my hand over my mouth and then my other hand tightly over the first, instinctively as if I felt that all of me might somehow spill out with the crying and the rocking. “Sorry for your loss.” It’s what we say, and I heard it differently than I ever had before. The word “loss” now weighing on a tender piece of my heart that will never be quite the same. Sharing the first Paragraph of my book, Embracing Charlie; it seems different now. I Love you Dad, and I take comfort knowing that you’ve been made whole again, I’m sorry it was such a long road. See you on the flip side. This entry was posted in grief, loss. Bookmark the permalink. My heart is with you! He was a good Dad, a good man. Oh Mindy, I’m so so sorry. We lost Kevin’s Dad 1 Friday before and I miss him so much. I will keep you and your family in my prayers. I’m hugging you my dear friend. Thank you Tess, Sorry for your recent loss also! Thank you for sharing this beautiful tribute to your dad. My heart sorrows with you. God grant you peace. Hey sis, that was amazing and so heartfelt. I am amazed by how you captured every detail, exactly the way it happened. That was so beautiful. Thank you. Your exquisite writing portrays such love. Mindy, I’m so sorry. I’ve lost both my parents and they were hard transitions. May God be with you and hold you. He is holding your Dad in the palm of His hands. My deepest sympathy.